1 of 4 In medium bowl, whisk flour, baking powder and salt. 2 of 4 In large bowl, beat butter and sugar until smooth. Beat in egg, then yolk and vanilla. Stir in flour mixture. 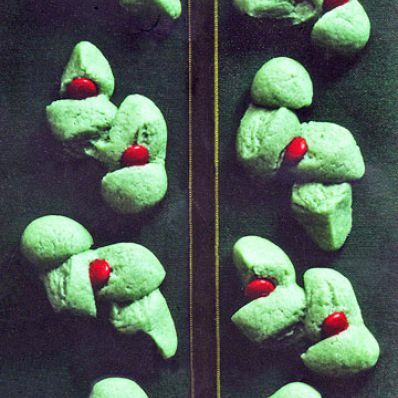 Tint dough green with food coloring. Wrap dough in plastic; refrigerate 2 hours. 3 of 4 Heat oven to 350 degrees F. Using a heaping teaspoon dough, shape into a 2-inch log. Place on ungreased baking sheet. With scissors held at a 45-degree angle, make 3 snips along the length of the log, on the top, at 1/2-inch intervals; do not cut completely through dough. Twist cut pieces in opposite directions, to form leaf-shaped pieces that are still attached to each other. Pinch top and bottom leaves slightly. Repeat with remaining dough. Decorate with one or two red candies per cookie. 4 of 4 Bake cookies at 350 degrees F for 10 to 12 minutes, rotating pans halfway. Transfer clusters to racks to cool. Store at room temperature for up to 2 weeks.